We started 2016 by banging on drums. It sounds raucous but it was actually a gentle and lovely introduction to the prehistoric art of frame drumming. 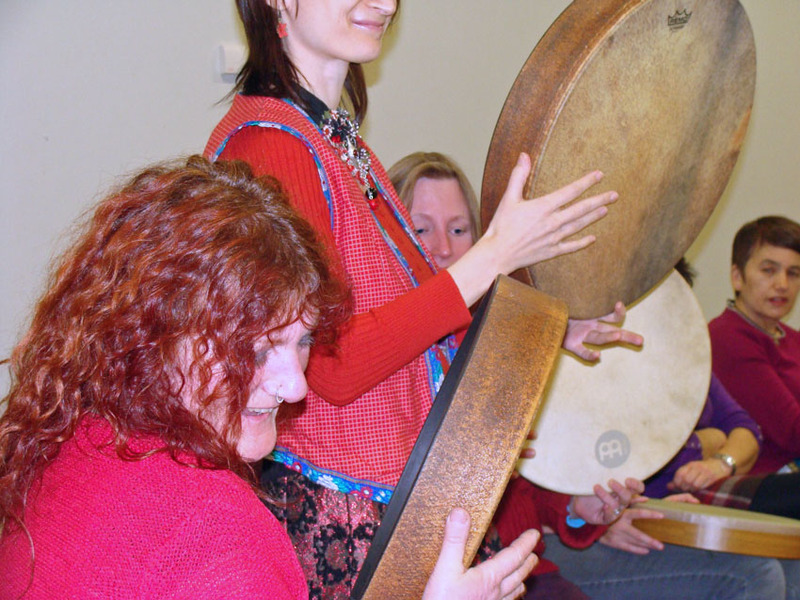 Oxana, Sarah and Sandi from Todmorden Frame Drum group came to teach us more about this fascinating instrument. This was a busy meeting with around 50 women attending. 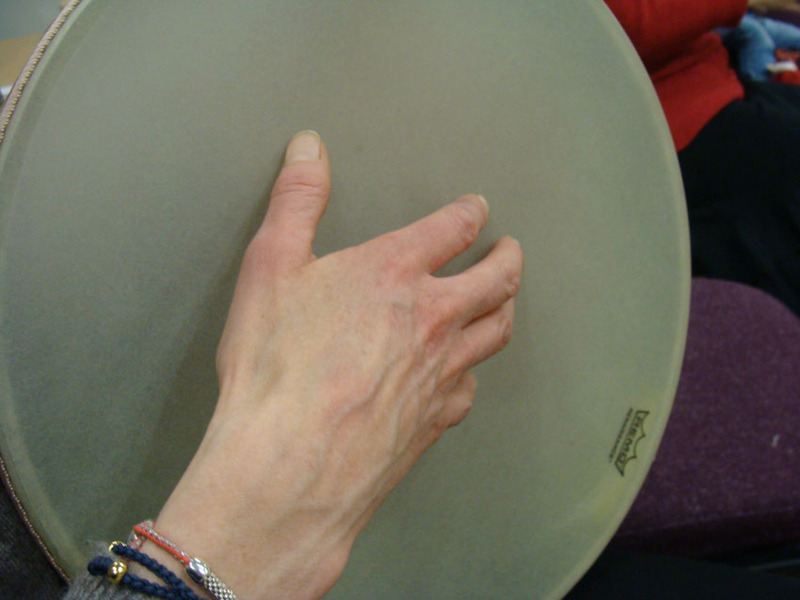 A frame drum is a drum with a drumhead that is wider than it is deep and unlike the drums in a drum kit, you play them by holding them vertically in one hand and striking them with the other hand. You can play sitting down or standing up, although standing up is more difficult. In some traditions, you hit the drum with a stick but often you simply you use your hand, striking with different parts of your hand on various parts of the drum to get a wide range of sounds. Frame drums are incredibly ancient; they are one of the first types of instrument we have evidence for and are probably the oldest drum invented. When you play a frame drum, you are joining an unbroken musical tradition that stretches back beyond recorded time. Frame drums were often strongly associated with women’s spiritual practises in prehistory. Our teacher, Oxana, made us laugh by describing old statues that showed women drumming which archaeologists originally thought were ‘women holding cakes’ despite the fact that no one holds their cakes vertically! Frame drums are common throughout the world. 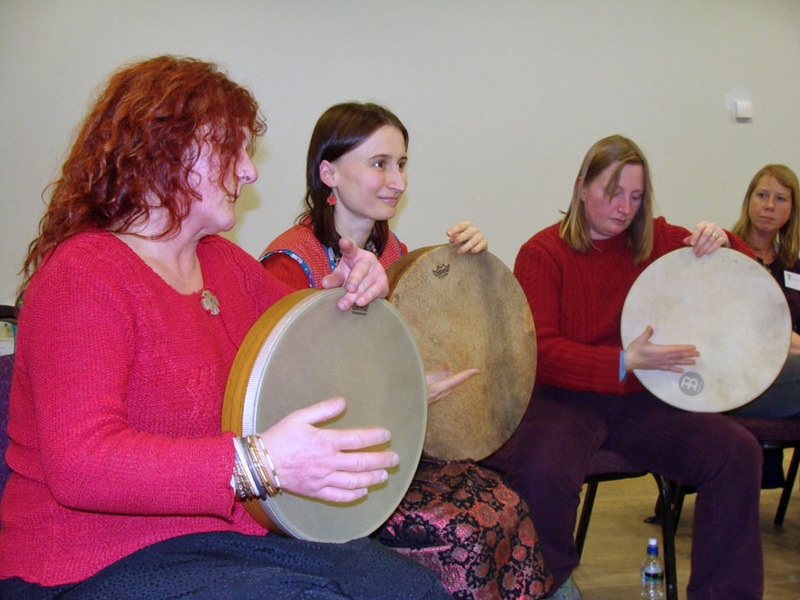 You may be familiar with the Irish Bodhrán, the shamanic Sami drum from Nordic cultures or Middle Eastern and North African Tar drums. The Cornish version is, rather delightfully, known as a Crowdy-crawn. And you’ve almost certainly already played one… that ubiquitous childhood instrument, the Tambourine, is also a frame drum. We worked our way up to singing and drumming an entire chant. 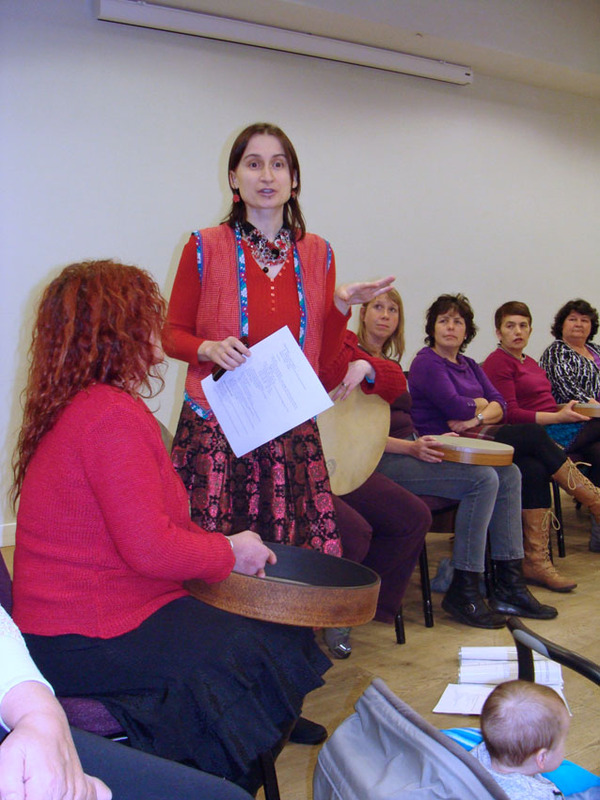 A roomful of women singing and drumming is indeed a marvellous thing – it was surprisingly moving and even those who chose not to drum really enjoyed the session. We were also charmed by the presence of Oxana’s very well-behaved baby. He has clearly inherited his mother’s talent because he was transfixed by the drumming and was moving his hand in time to the beat. Which bit do we hit again? This soothing and nourishing session was just what our members needed after the horrors of the Boxing Day floods, which devastated so much of the north including the centre of Hebden Bridge where we shockingly lost about 80% of our shops and amenities. Many of our members were directly or indirectly affected and as this was the first post-flood meeting, we were all still quite shaken up. But we couldn’t have asked for a better meeting to ease us back into WI life and Todmorden Frame Drum Group kindly donated their fee for the evening to the flood relief efforts, which was greatly appreciated. Todmorden Frame Drum Group have written more about the session here. 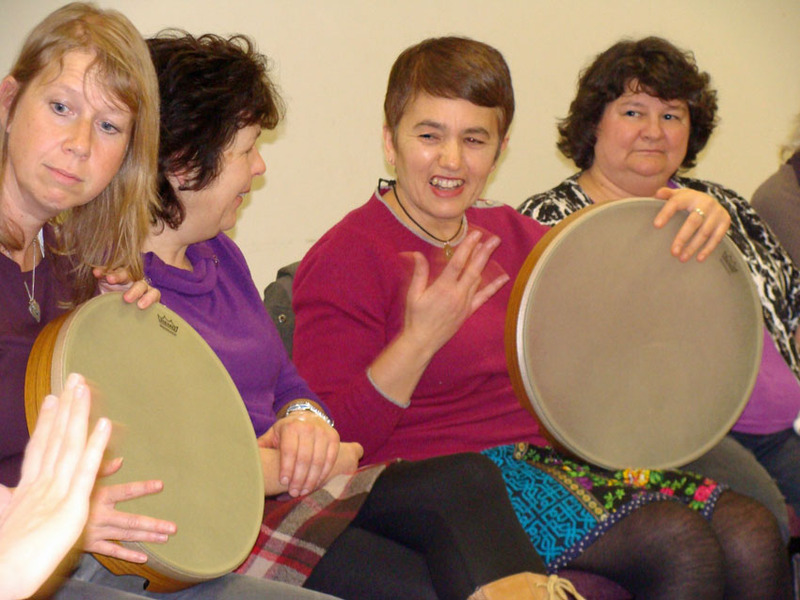 We had a great time with them and thoroughly recommend them to other WI’s in the area who fancy a bit of drumming. Dear women of Women’s Institute Hebden Bridge! Oxana of Todmorden Frame Drum Group here. Thank you so much for the lovely evening we spend with you and for this gracious report. 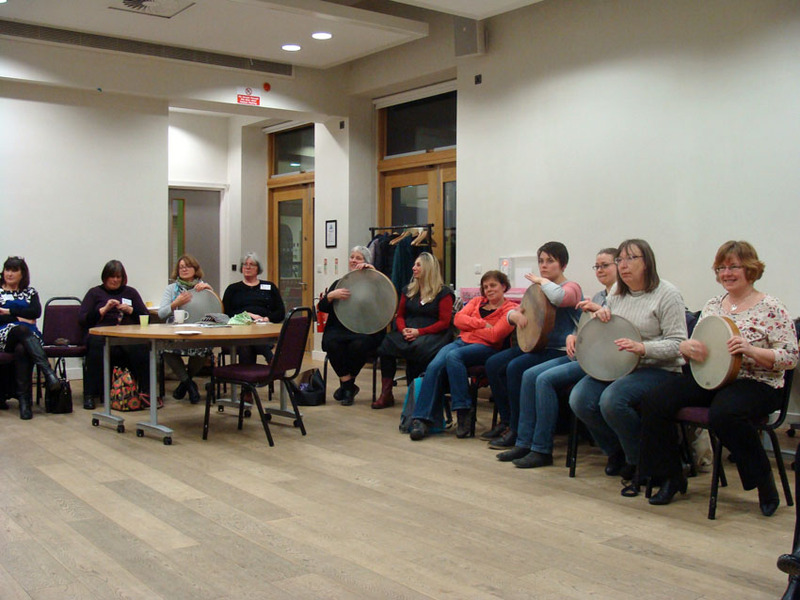 There is nothing we enjoy more than drumming with each other, and sharing frame drum with women as far and wide as possible. Best wishes to you all, and best wishes to all affected by the floods, may we all recover!